My first encounter with the book of Revelation was fear mixed with intense curiosity. Who didn’t get a few chills running down their spine about the number 666, the “mark of the beast,” the seven plagues and a dramatic portrayal of the “end time”? Still I wanted to know more about this book. I studied and taught Bro Irwin Baxter’s material on prophecy called “Understanding the End Time”. Then I stumbled across a number of studies that made an intelligent versus fanciful media-hyped approach to the book. It addressed Revelation as a coded message, but written to 1st century churches who were part of its history and time. The evidence focused on the date of the writing of the book of Revelation. It raised and answered the question, was Revelation written pre or post A.D. 70? The date A.D. 70 is an important date because it’s when the last Jewish Temple was destroyed by the armies of the Roman General Titus. Also, an investigation of the internal evidence and alignment with other texts as commentary overruled the temptation to rely on imagination and the media. Considering these points was one of the most enlightening and satisfying decisions in my quest to understand the message of Revelation. Who wrote the book of Revelation? The answer is John the Apostle! To whom was Revelation written to? The answer is seven Churches in Asia. When was the book of Revelation written? There are two major theories: Late Date Theory – 95 A.D. or the Early Date Theory – A.D. 60s. I believe Revelation written in the 60s A.D. There are many reasons for this belief. John would have been over 90 yrs old if the 95 A.D. date is used. Paul built nine churches in this area. Three were destroyed by earthquakes. Only Laodicea was rebuilt. There was only a short window of time when there were seven churches. And that was the during the 60’s A.D. The most compelling reason for an early date is the destruction of the Temple in 70 A.D. Revelation 11:1-2 mentions that the temple was measured. Not one verse in Bible speaks of a rebuilt Jewish Temple. What I have discovered is that all scriptures used to support a rebuilt Temple are referring to the return of the Jews from either Assyrian or Babylonian captivity. These are all past events that are not in our future. Also Revelation 17: 1-2 is similar to Luke 21:20-24 (referring to Jerusalem being trodden down). Jerusalem was “trodden down” in 70 A.D. Armies led by the Roman General Titus surrounded the city and utterly destroyed both the city as well as the Temple. History confirms that not one stone was left upon another just as Jesus prophesied in Matthew 24:2. So what about “Mystery Babylon”? What follows are a few keys that were convincing to me. A mystery is not something that cannot be known, but simply that which is not known until it is revealed. Many people think of the book of Revelation itself as a mystery. However, the word Revelation in Greek is apokalypsis, which means the “unveiling” or “revelation”. The seven points in this article will help you solve this “mystery”. In Revelation, “Babylon” is a code word for the mystery city. What is significant about the ancient city-state of Babylon? Babylon is mentioned 250 times in our Bible. It is referred to by Bible writers as being the symbol of pagan idolatry. In the Hebrew language, the name Babylon is derived from the root “Babel”, meaning “to confound or confuse.” It has reference to the confusion of tongues that occurred at the Tower of Babel (Genesis 11:9). The Genesis account says the ancient prehistoric city of Babylon was founded by Cush and the followers of Nimrod (Genesis 10:8-10). The sins of Babylon were many and paralleled what was proclaimed in Genesis: the lust of the flesh, the lust of the eyes and the pride of life. Isaiah condemned the city for its sensuality. In Babylon, fleshly lusts could easily be indulged. Babylon followed after the lust of the eyes conquering many weaker nations. Her capacity for bloodshed and violence were unconstrained. Babylon was a prideful kingdom. Nevertheless, she would be overthrown and brought low. Babylon is synonymous with sin, wickedness and rebellion against the one true living God. The imagery of the filled cup of iniquity indicates that God’s period of longsuffering had run its course. Genesis 15:16 shows why God expelled the Amorites from the land in order that Israel might inherit Canaan. “But in the 4th generation they shall come hither again: for the iniquity of the Amorites is not yet full.” The reason he didn’t do so immediately was because the iniquity of the Amorites was not yet full. Their cup of sin had room for more and did not run its course until the time of the Exodus. God is longsuffering. 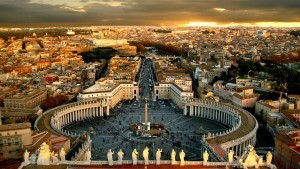 This city called “Mystery Babylon” was guilty of shedding the blood of the apostles & prophets. God avenged the blood of the apostles and prophets. Not only was their blood to be avenged, but God avenged all the bloodshed on the earth on Mystery Babylon. Jesus predicted the same for Jerusalem. In Matthew chapter 23, Jerusalem is charged with the blood guilt of all the righteous blood shed on the earth up to that time. Jesus would send more wise men, scribes and prophets whom he said they would scourge in their synagogues and persecute from city to city until He (Jesus) destroyed Jerusalem. It, therefore, matches perfectly with this description. “Mystery Babylon” Was Once a Queen. The term “queen” implies that she is royalty by virtue that she is married to a “king”. This reference to a “queen” identifies the city as having a covenant relationship with God. Neither ancient Rome nor any other modern city could appropriately be considered as God’s wife. Through the Old Covenant, God was married to Jerusalem, (Jeremiah 2:14). Because of her unfaithfulness, God threatens divorce. While “Mystery Babylon” claims to be a queen, she is widowed. The contrast between the two cities in Revelation is a strong clue to the identity of Mystery Babylon. After the great city, “Mystery Babylon” is destroyed, God blesses a New Jerusalem. That implies an Old Jerusalem. You can’t have a “New Jerusalem” without having an “Old Jerusalem”. Paul writes that the church is the bride of Christ. Here are two scriptures to highlight this fact. However, there are many more. The new holy city Jerusalem, takes the position as bride, while the former adulterous wife receives death by fire. The call to God’s people to come out of Mystery Babylon” further aligns with the ancient city of Jerusalem. Prior to its destruction, Jesus warned that his disciples should flee the city to avoid its plagues of destruction, famine and death. (Matthew 24:15-17; Luke 21:20-22). In Luke 21:24, Jesus remarks that Jerusalem would be trodden down of the Gentiles until the times of the Gentiles were fulfilled. Forty-two months equals 1,260 days or 3 1/2 years. This period in Daniel 7:25 symbolizes a limited period during which the wicked are triumphant. It also speaks of a period of wrath and judgment due to apostasy. Whereas the number seven is used to represent “wholeness” and “completion”, the number 3 1/2 appears to be a broken seven; symbolizing sadness, death and destruction. Further identifying “Mystery Babylon” as “The Great City”, leads us to clue number seven. Besides the actual city of Sodom, there’s only one city in the Bible ever referred to as Sodom. And that city is Jerusalem. Jerusalem was “the great city” where our Lord Jesus was crucified. The description, where also our Lord was crucified is strong evidence pointing to Jerusalem. Jesus Christ certainly wasn’t crucified in Rome! Further, it would be unusual that a prophet would perish outside of Jerusalem. In other words, Jerusalem was THE place where the prophets of the Old Testament perished. To the Jews, Jerusalem was the greatest city in the world. Therefore, “Old Jerusalem” is A Perfect Match for “Mystery Babylon.” Everything said about Jerusalem in the gospels, is symbolically described as “Mystery Babylon” in the book of Revelation. There are more contrasts and parallels, but these should at least get one thinking. Fanciful and colorful charts, like those presented by John Hagee and others, will forever fail to identify properly “Mystery Babylon”. As long as they are pointed in the future and toward some city or nation that has no antithesis with old Jerusalem. Furthermore, a modern or present day Jerusalem, doesn’t descend from heaven and can never be the holy city of Revelation chapter 21. It may not frighten us as much, but it certainly encourages us with the message of faith, confidence in God’s sovereign power and victory over the forces of evil. The “Mystery Babylon” of the book of Revelation is clearly the ancient city of Jerusalem.